PETITION OF THE PEOPLE PROTESTING AGAINST ANNEXATION, 1897. PALAPALA HOOPII KUE HOOHUI AINA A KA LAHUI. I ka Mea Mahaloia WILLIAM McKINLEY; Peresidena, a me ka Aha Senate, o Amerika Huipuia. O Makou, na poe no lakou na inoa malalo iho, na Hawaii oiwi, a me na kupa makaainana a poe nooho hoi no ka Apana o …………………….Mokupuni o ……………………., he poe lala no ka Ahahui Hawaii Aloha o ko Hawaii Paeaina, a me na makaainana e ae i like ka manao makee me ko ka Ahahui i oleloia, ke kue aku nei me ka manao ikaika loa i ka hoohuiia aku o ko Hawaii Paeaina i oleloia ia Amerika Huipuia i oleloia ma kekahi ano a loina paha. To His Excellency WILLIAM McKINLEY, President, and the Senate, of the United States of America. We, the undersigned, native Hawaiian subjects and residents of the District of …………………… Island of ……………………., who are members of the Hawaiian Patriotic Leagues of the Hawaiian Islands, and other citizens who are in sympathy with the said League earnestly protest against the annexation of the said Hawaiian Islands to the said United States of America in any form or shape. 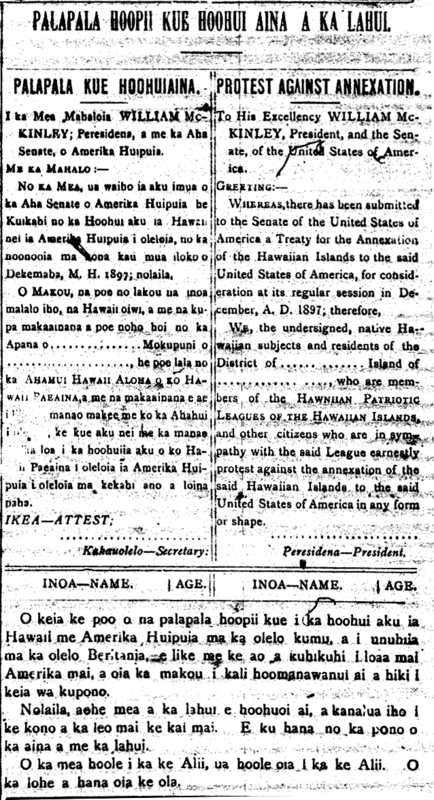 This is the heading of the petitions protesting the annexation of Hawaii to the United States of America in the original language, and translated into English, and as per the instruction and direction coming from America, we waited patiently until this proper time. Therefore, there is nothing for the lahui to be suspicious about, or to be wary when the voice from the sea beckons. Stand up and do what is pono for the land and the people. The person who denies that of the Alii denies that of the Alii [this is probably a typo that should have read, “O ka mea hoole i ka ke Alii, ua hoole oia i ka ke Akua,” The person who denies that of the Alii denies that of God]. Listening and acting is the way to survival. Ke Aloha Aina, Buke III, Helu 38, Aoao 5. Sepatemaba 18, 1897. More maps from the University of Hawaii at Manoa Library, 1540–1994. Restored Maps from the Flood of 2004. This is a collection of just a few of the many maps which were damaged by the flooding of Hamilton Library back in 2004 and which were subsequently cleaned and restored. They feature maps of the world including some of Hawaii nei. BASE MAP ISLAND OF KAUAI, KAUAI COUNTY, TERRITORY OF HAWAII, 1939. Maps, courtesy of the University of Hawaii at Manoa Library, 1891–1906. Here are more helpful digital images put up by the University of Hawaii at Manoa Library System! They are fire insurance maps done at the turn of the century, and give you a better picture of what the streets of Honolulu looked like back then. 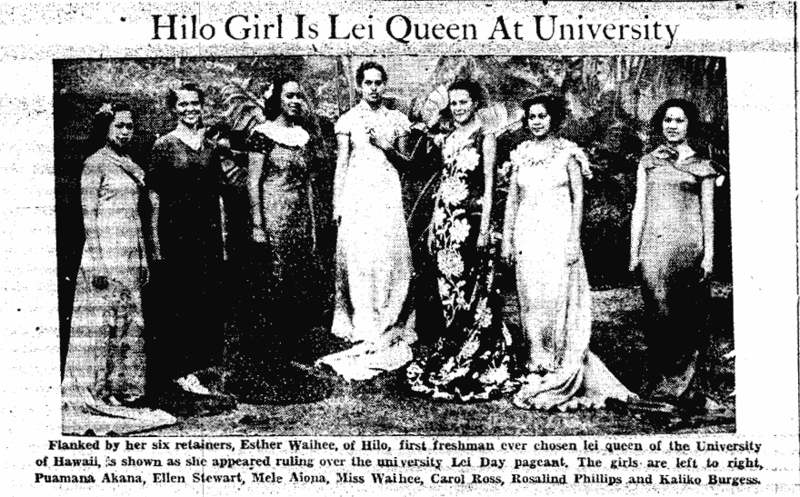 More English-language Hawaii papers to be searchable online! 2012.